Rafael Nadal became the first man to win eight titles at the same Grand Slam tournament after beating fellow Spaniard David Ferrer 6-3, 6-2, 6-3 in the French Open final on Sunday. If Rafael Nadal truly was going to be challenged, if his bid for an unprecedented eighth French Open championship would be slowed even a bit, this might have been the moment. Ferrer glared at the ball as it flew past and landed in a corner, then smiled ruefully. What else was there to do? Dealing with Nadal's defence-to-offence on red clay is a thankless task. His rain-soaked 6-3, 6-2, 6-3 victory over Ferrer on was Nadal's record 59th win in 60 matches at the French Open and made him the only man with eight titles at any Grand Slam tournament. "Winning 17 Grand Slam titles, that's miles away," Nadal said with his typical humility. "I'm not even thinking about it." 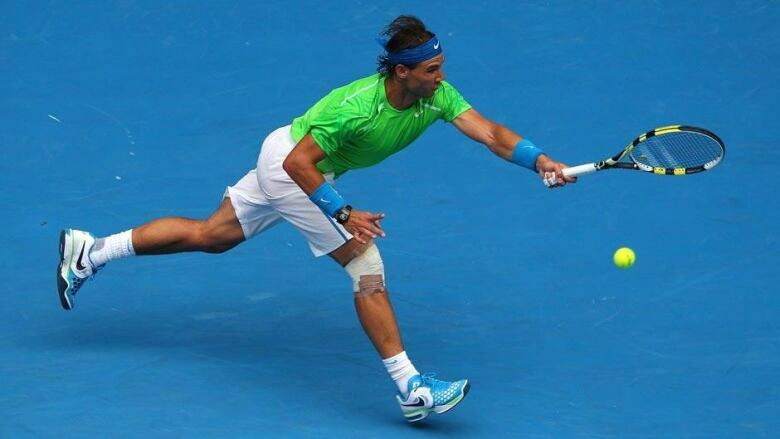 Let's be plain: No one, perhaps not even Ferrer himself, expected Nadal to lose Sunday. Nadal had yet to make his French Open debut then, missing it that year because of a broken left foot. On May 23, 2005, Nadal played his first match at Roland Garros, beating Lars Burgsmuller 6-1, 7-6 (4), 6-1 on Court 1, known as the "bullring" because of its oval shape. There was occasional shakiness this year. Nadal lost the first set of each of his first two matches, and was pushed to a tiebreaker to begin his third. His fourth match, a straight-set win against No. 15 Kei Nishikori, "was a major step forward," Nadal said. Still, he barely edged No. 1-ranked Novak Djokovic in a thrilling semifinal that lasted more than 4 1/2 hours and ended 9-7 in the fifth set Friday. By any measure, that match was far more enjoyable to take in than the final, akin to dining on a filet mignon accompanied by a well-aged bottle of Bordeaux — each bite and sip rich, textured — one day, then grabbing a hot dog and can of soda from a street vendor 48 hours later. That's when Nadal took over, winning seven games in a row and 12 of 14 to render the ultimate result pretty clear. It was as if he simply decided, "Enough is enough." His court coverage was impeccable, as usual, showing no signs of any problems from that left knee, which was supported by a band of white tape. His lefty forehand whips were really on-target, accounting for 19 of his 35 winners and repeatedly forcing errors from Ferrer. Yes, Nadal is No. 1 at the French Open, without a doubt. When the ATP rankings are issued Monday, however, he will be No. 5, due to points he dropped while hurt. Oddly enough, Ferrer will be at No. 4. "Yeah, it's strange, no? I lost the final against Rafael, but tomorrow I am going to be No. 4 and him No. 5," Ferrer said with a grin, then delivered his punchline: "I prefer to win here and to stay No. 5."